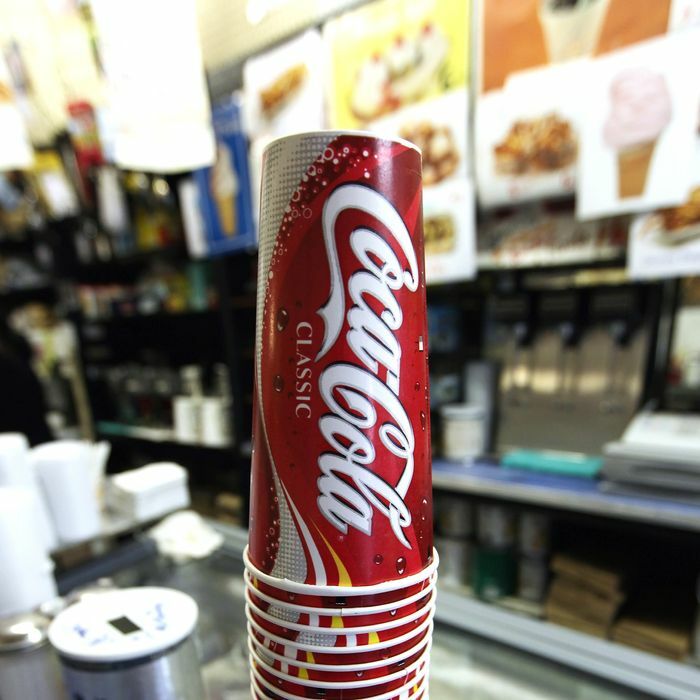 This morning, New York City’s Board of Health approved Mayor Bloomberg’s plan to ban the sale of sugary drinks larger than sixteen ounces at restaurants, movie theaters, and other establishments that receive Health Department inspection grades, in an effort to trick people into being skinnier. Beginning in six months, on March 12, 2013, unless the rule is blocked by a judge, soda fiends will be forced to buy multiple cups of syrupy liquid if they plan on being truly satisfied. The board’s chairman, Dr. Thomas Farley, called the decision, the first of its kind in America, “historic” and said he hopes it will “spread nationally.” There are no signs of an uprising from the opposition so far. A Health Department spokesperson said the city fielded 38,000 comments from the public on the proposal, only 6,000 of which were against the ban, despite the soda lobby’s $1 million PR campaign against Bloomberg’s tyranny. A recent poll found that 60 percent of New Yorkers oppose the plan, although almost none of them showed up for a public hearing on the matter. It would affect a range of popular sweetened beverages, including energy drinks, presweetened iced teas and common brands of nondiet soda. The restrictions would not affect fruit juices, dairy-based drinks like milkshakes, or alcoholic beverages; no-calorie diet sodas would not be affected, but establishments with self-service drink fountains, like many fast-food restaurants, would not be allowed to stock cups larger than 16 ounces. Just don’t let anyone tell you the Big Gulp is dead: Stores like 7-Eleven and your local bodega are exempt, as are vending machines, which in the name of capitalism should just go the opposite direction and starting popping out two-liters.